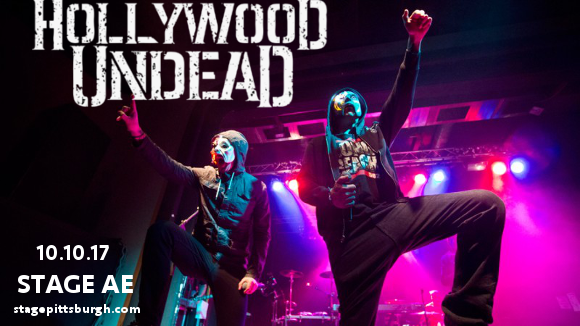 Things are getting exciting at Stage AE – Hollywood Undead are on tour with their upcoming 5th studio album!! Accompanied by the Butcher Babies as support, tickets are now confirmed and on sale – grab them now and catch the legendary rap-rock band live on Tuesday 10th October 2017! Formed in 2005 in Los Angeles, Hollywood Undead have fiercely followed their own path since day one, with their eclectic yet immersive blend of rap and rock. “Our band has been being run by us since the day one. We write and record our music, so we could do all of this on our own, like, forever, if we want to,” said Jorel Decker in 2013. Now that time has come!! 2017 marks a historic moment when California’s infamous masked band go it alone, quitting their record label and starting their very own!! The new album, released on the band’s independent label, is entitled “Five,” a number of huge personal significance to the band – the band are a 5-piece, and the title also pays homage to “No. 5,” the fifth track of their first album, “Swan Songs”. Listen to the first single from the new record, “California Dreaming,” below. The new album is due out on October 27 – you can bet they’ll be performing all the new tracks live in concert!! Get ready to be one of the first to hear all the new material live – book your tickets to see Hollywood Undead with the Butcher Babies live NOW while they last! !